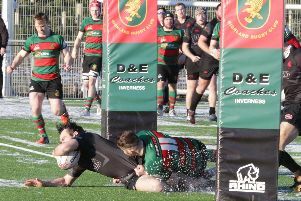 Biggar Rugby Club enjoyed a handsome 55-7 league win over Hillhead Jordanhill, yet to record a win in BT National League Division 2 this season. Saturday’s rout saw Biggar sew up the four-try bonus point in the first half before allowing Hill Jills back into the match just before half-time – and when ironically the Glasgow side were down to 14 men – when a score was conceded under the posts to James Lowry. Rory Harte kicked the conversion. After the break Biggar continued in similar form by scoring another five tries to secure the 55 point total. There were several highlights on the day with great carries from Jamie Orr, Andrew Orr, Ewan Stewart and Ross Jackson, the last named romping home from some 60 metres after ball was plundered from a Hill Jills attack. This effort and several other telling contributions in both attack and defence earned the breakaway the Biggar man-of-the-match award. The Hill Jills winner was Wallace Nelson. Aird Jardine again showed some deft touches with the boot which kept the Hill Jills defence in check while Robbie Lavery made some telling bursts, one of which led to a try for himself and a later effort which saw his offload taken by Sinclair for a try. David Paterson looked full of running and probably should have had more than one try while one well-timed cover tackle saved what would have been a certain score. For the record, Biggar tries were scored by Ewan Sanderson (2), Alisdair Sinclair (2), Andrew Dunlop, Ross Jackson, David Paterson, Robbie Lavery and Aird Jardine (who also kicked five conversions). Biggar’s final points total could as easily have been nearer 80 such were the number of chances created and which then fell foul as passes were dropped or defence stood up to the Biggar runners. Add to that the missed conversions from Aird Jardine who had a mixed day with the boot, kicking five from nine, and it is easy to see how the 55-point total could have been exceeded. This win takes Biggar from ninth place to a much healthier seventh spot. With six games remaining and with four of these against teams below them there is an outside chance of sneaking a fifth place finish. But this would only come about if other results went Biggar’s way. Given however the recent run of defeats prior to the Hill Jills game, a seventh spot for Biggar come the end of the season may well be as welcome! The side travels this Saturday, January 28 to take on 10th placed West of Scotland, this the game postponed from last week because of frost.